ETA: Linking with Clever Chameleon since color decisions were involved. Satisfactorily in the binding of the pink one, less so in the addition of green (opposite color scheme) as accent. The retreat was in the summer of 2015. I finished the tops fairly quickly (post about retreat with tops finished here); quilting took longer (red one here but I think I had decided not to post the quilting on the pink one till it was bound) and the second binding longer yet. It’s been washed, so it has that crinkly look. And here you can see the leaf pattern, an idea I got from Christina Carmelli. And here is the second one quilted and bound. The quilting is a simple meander, done a couple months ago. One thing holding back the binding is that I’d planned to match the blue of the pinwheel in the middle. But the back said, No. Finally I finished a project that the rust batik had been held for (here–those trees had been intended for a large quilt), so it was released for other uses. And it worked well for both sides. These blocks were contributed by many members of the Sunshine online guild (now on MeWe more than on Yahoo); whether from scraps or yardage, the end result is a scrappy quilt. Since this is almost the 15th, check out Scrap Happy for what others have done with scraps. This quilt from Latifah Saafir’s workshop is the second of three for the upcoming guild show. The quilting continued well; the binding took longer than planned. I was halfway around the quilt on the first seam when I realized I was sewing binding to the front instead of the back. I pondered ripping it out, but decided that would take as long as hand sewing the second seam. I’ve made that mistake before, but I usually catch it a couple inches in. I haven’t sewn the hanging sleeve yet because I’ve not decided which side is top. I thought I wanted those bendy long “stems” on the bottom, reaching up like real plants do.. But now I’m leaning to this one. It seems more stable and the long stem swoops move the eye around more than the other way. But just for the sake of completeness, here are views 3 and 4. Or maybe it doesn’t matter at all. After the guild quilt show it will become a lap quilt for someone in a nursing home. The other design decision was color of binding. I’d considered green as well as yellow. Yellow won because some of the loops are so close to the edge that the green crowded them. 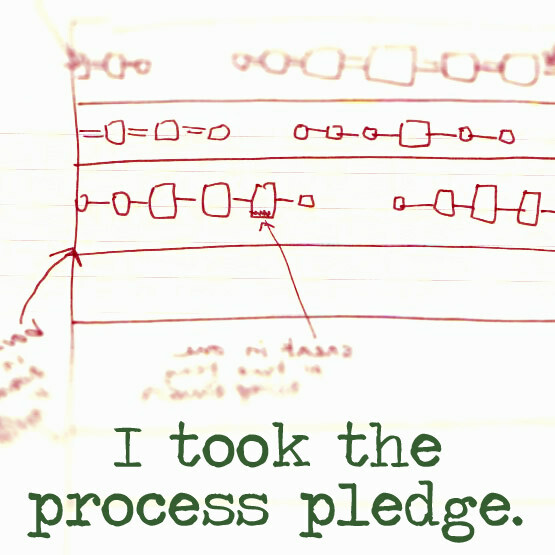 The quilt’s history starts here ( reverse order) where other design decisions were discussed. On to quilt number 3. A little over a week is plenty of time. I left off on this top after being disappointed that my choice for a border did not work. Plan A had been to make the border from stash. However, nothing that I already owned really worked. I finally gave in and went shopping (oh darn!). And I am happy with my choice. Guild has been in need of twin sized quilts the last couple of months, so it was time to get this one on its way. Someone else will be quilting/knotting and binding it, so I’ll not see the finish nor be able to show it here. To visitors from Scrap Happy: This is at least partly a scrap quilt. The middle color is from my scraps and the kit was made up from guild members’ left overs. 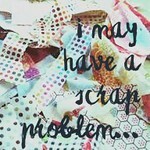 Other readers might like to view Scrap Happy to see what folks are doing with all scraps. And during the quilting silence, I’ve been knitting squares for blankets for orphans. A friend of mine had volunteered more than he could get finished, and I had time, so helped a bit. It would certainly be fun to be on the receiving end and be arranging squares from 400+ selection! The square was a perfect size for using up bits of left over yarn that had been seeking a project. You can see I have a few ends to weave in. Every craft has its dull moments. I finished the last four baby quilts just in time to get them to guild for the fire fighters’ pick up for Toy and Joy. The guild has given 2044 this year. (Membership is around 300.) Earlier quilts are two posts back. The first two are made from larger scrap left overs, but they both needed additions. (I’ll trim the empty space when I have my photo program again–and have time. Done!) The blue print is a batik of little baby feet. I try for at least a few kid friendly fabrics. This quilt gets its kid friendliness on the back with this cute bear-print flannel. I used all I had mixed with left over green and blue checked pieces. The yellow in the photo is green IRL. The last two were made from a mix of 6-inch squares. My first consideration was alternating lights and darks. Some of the darks aren’t very dark–just darker than the squares beside them. Since I was running out of darks i repeated more than I would have liked. I spread them around as much as possible. I also made sure “stand out” colors–yellow and that bright green–were spread evenly. I quilted with a light tan 50-weight Aurofil thread; it blended with the lights and will sink into the darks after the quilts are washed. I used a meander for each; it worked well except on prints with a high proportion of dark background. I had this square finished before I realized the problem. So I tried for the look of water on the rest. The 4 squares in these quilts are the very last of my bridge fabric. I hate to see it gone. Toy and Joy month snuck up on me, and I hadn’t prepared ahead even though I always think I will start early. The only start I had was the tops for two doll quilts that were my leaders and enders at a summer retreat. These are now finished. They are made from mini charm packs that we got in swag. Bordered they are ~16 x 16. The quilting doesn’t show well in the photos. The brownish one is diagonal lines and the blue one concentric circles. However, I don’t recommend the circle quilting for a quilt that has been stitched to the back and turned. Even with a walking foot, the fabric bunched up. I don’t think the doll or child will mind this time, but I’d not do it again. The backs are minky fabric, and I still haven’t used up the leftovers. So I guess I’ll be making doll quilts next year till it is gone. However, I’ve shifted my focus to the baby quilts because of the fire fighters running out last year. Seems the need is greater for them. The baby quilts are used beyond Toy and Joy time when fire fighters have to remove babies from burning homes. So I have one finished and four more tops ready to sandwich and quilt. Over the year I’d cut scraps into various sized squares. These are the 6 1/2 inch squares that easily make a 36 x 36 quilt. I use the term “scrap” somewhat loosely to include fairly large left over pieces that could be called yardage. But if I have no further planned use for them, they are scraps to me. That is how I get many matching squares–however almost never the requisite 18. Quilting is a simple meander. Linking with the Friday finish blogs and Oh Scrap (buttons in sidebar) and Let’s Make Baby Quilts. Now excuse me while I get back to finishing the last 4.